Largo Police want to identify a bank robbery suspect who they say may have also robbed a bank in Clearwater Friday. LARGO, Fla. — Largo Police want to identify a bank robbery suspect who they say may have also robbed a bank in Clearwater Friday. Tuesday just after noon, the suspect entered the Wells Fargo Bank at 5250 East Bay Dr. and robbed a teller of an undisclosed amount of money. No weapon was displayed. He is about 5'10" and 170 lbs. He was wearing a black jacket and hoodie with black sneakers. He left the scene in a white compact vehicle. 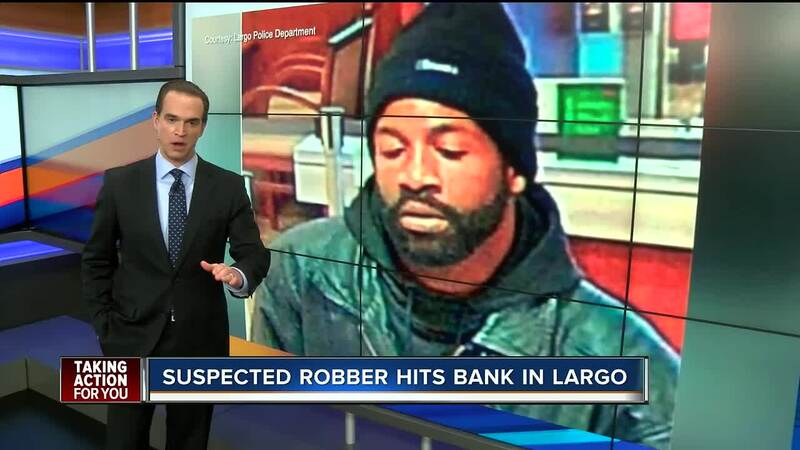 Largo PD believes it could be the same man who robbed a Wells Fargo across from Clearwater Mall Friday. If you have any information on the man, please contact Largo PD or Clearwater PD.